Includes a second door for added flexibility in use and transport. Features updated styling and colors and are designed to meet the requirements of the international air transport association (IATA). 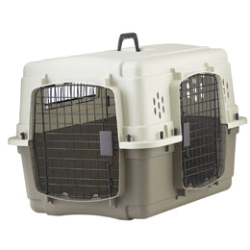 The easy-to-assemble design includes durable wire doors and vents and rugged polypropylene construction, which is strong enough to withstand the rigors of travel and regular use.